I already donated it to the University of Texas Insect Collection. "Ants of North America" by Fisher & Stefan and their photo of Discothrea testacea shows an ant with vestigial eyes. Might this one be a male? Sorry to take a while to get back to this, Diane. Fisher and Cover's image is of a worker. Your specimen is not a male, but a winged female (potential queen). These have fully developed compound eyes. By the way, I am quite certain that Dr. Fisher (at Cal. Acad. of Sciences Entomology Dept.) would be most appreciative to receive this specimen for the AntWeb collection. I still have the specimen if anyone is interested. This one was caught sweeping low grass (probably not native) near the San Marcos River in an area that is surrounded by tall oaks, cedar elms and sycamores. 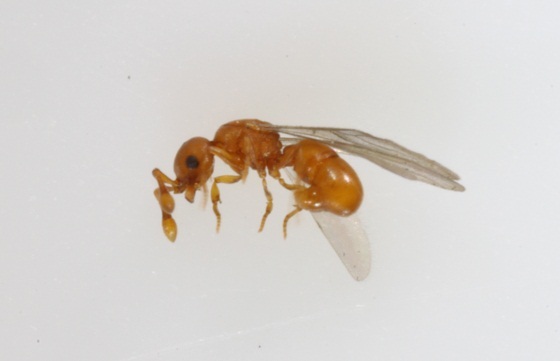 This is the first image of this tiny, cryptic, proceratiine ant at BG! They are rarely seen alive, typically only as specimens in a Berlese or Winkler sample. Can you provide more details of the habitat around the swept grass?